Samsung's new flagships have just been announced and it's hard to think of Samsung without calling to mind its big rival. So here is a preliminary comparison between the new Samsung Galaxy S9/S9+ and Apple iPhone X based on the first impressions collected during the Mobile World Congress in Barcelona. On the design side, the Galaxy S9 and S9+ do not show any substantial changes. The sleek lines and curves of Korean smartphones enchanted us with the Galaxy S8 line and their successors are no less attractive. On the other hand, Apple's smartphone isn't bad looking either, just different. Each device has a metal body that divides the two glass panels on either side of the smartphone. The screen on the Galaxy S9 is surrounded by almost non-existent bezels on the sides where the OLED panel is curved, while the upper and lower bezels are slightly more pronounced. Apple iPhone X uses a different approach with its flat OLED panel and bezels around the display reduced on all sides, but not necessarily too thin. In addition, Apple's smartphone has a notch on the display where FaceID and the other front sensors are located. For some the iPhone X notch is extremely annoying, for others it's only mildly annoying. In any case, I find Samsung's approach slightly more elegant. That said, both smartphones are made of premium materials and are very comfortable to hold, with the S9s more prone to inadvertent taps on the display due to the curvature. The displays are equally good (even produced by Samsung for the Cupertino smartphone) despite the fact that color calibration is totally different. Samsung still uses a higher resolution panel (2960 x 1440 pixels vs. 2436 x 1125 pixels on iPhone X) and the colors are more captivating, even if they are less true to reality. The Korean company has also tried to correct the main criticism of the Galaxy S8 since its launch, namely the positioning of the fingerprint reader, which is now much more accessible. Apple has solved the problem by not including this feature on the smartphone at all. In any case, at these extreme levels of quality, the choice is only a matter of personal taste. Apple's iPhone X features a dual camera with two stabilized lenses. This allows the Apple smartphone to snap great photos even in low light conditions and take trendy bokeh effect pictures. The Galaxy S9 Plus is no less impressive: the new premium Samsung has the same telephoto lens with the same 2x magnification we find on the Galaxy Note 8 as well as the new camera with variable aperture that will allow for better shots. Samsung's algorithms and sensor quality are also significantly improved compared to last year's model. To the advantage of the S9 and S9 Plus, we find the new feature of slow motion recording at 960 fps inherited from Sony smartphones in 720p resolution while the iPhone is able to record in FullHD resolution up to 240 images per second. 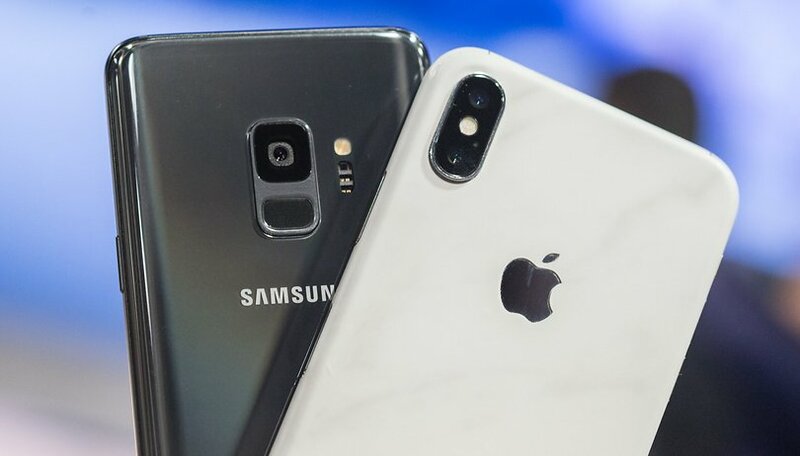 The new Galaxy smartphones will probably be able to take better photos thanks to more advanced image processing technologies, a better sensor, variable aperture and the presence of many modes, including manual and advanced night mode. On the contrary, the Apple smartphone will still have something to say about video recording, a subject in which Apple smartphones have always amazed. We will certainly test and compare the quality of the shots once we have received the final model of the new Galaxy smartphones. The main difference between smartphones is the operating system. Android vs iOS: a war as old as the smartphones themselves. Obviously, there isn't an absolute winner, it always depends on how you use your smartphone and on the capabilities you expect from it. Neither the Galaxy S9/S9+ or iPhone X lack in power or features and we know that comparing the specifications on paper has never brought anyone very far. Whatever app you want to use, you'll achieve its potential on any of these smartphones. The choice of ecosystem, rather than choice of device, is more important here. It's a matter of personal taste and habits: if you've been an Apple user for a long time, have bought many apps and have other devices like Apple TV or iMac, you would do well to turn your attention to the iPhone X. On the contrary, if you're linked to the Android world and you can't do without having freedom to customize, then Galaxy S smartphones represent the best available on the market. Be honest, which do you think is really the better phone? Choose “Galaxy S9+” or “iPhone X”. What do you think? Has the top iPhone or Galaxy ever made you think about switching sides in the eternal Android vs iOS war? This article will be extensively updated as soon as we receive the Samsung Galaxy S9 and S9+ for a detailed review in our editorial HQ. Never actually held an iPhone X, but the bezels doesn't appear that slim to me. Most people would consider price a big issue when they buy a new phone. An obvious winner there! Arguably the comparison is a phone released in March 2018 to a phone announced in third quarter 2017. Samsung would need to do a lot better.